S.Janani Research Scholar, VIT University, Vellore. Concrete is a composite building material. Due to its increasing demand in the construction industry, its basic ingredients such as cement, fine aggregate and coarse aggregate have become extremely costly. Studies have been carried out to find better and more economical alternatives to these conventional building materials. One such alternative is fly ash, which can be used to partially replace cement. The main disadvantage of conventional concrete is its brittle failure, which can be avoided by using steel fibers. 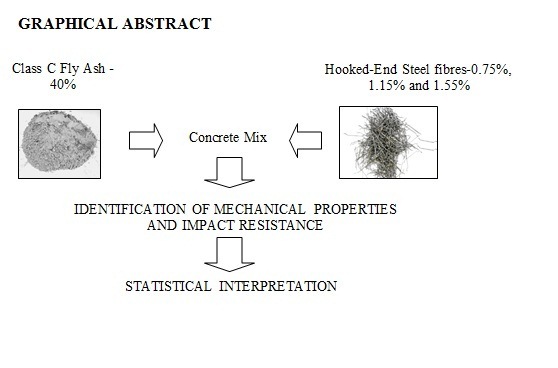 This study identifies the behavior of concrete with regard to impact resistance and its mechanical properties by adding hooked-end steel fibers at levels of 0, 0.75, 1.15 and 1.55% and partially replacing 40% of the cement with 40% fly ash. In addition to the control concrete, there has been four mixes with respective addition of steel fibers. The behavior of normal and fly ash concrete with steel fibers was compared. The combination of fly ash and steel fibers provided a homogeneous and very rich mix, with a delay in the setting time of the concrete. Of all the mixes, the one containing 40% fly ash and 1.55% steel fibers proved to be the best, with a maximum increase in strength of 17% in compression, 25% in split tension, 30% in flexure and 95% in impact energy at 56 days. A multiple linear regression model was also formulated using SPSS (Statistical Package for Social Sciences) software, through which corresponding equations were developed to predict the strength and energy at 28 and 56 days. The equations were also used to predict the strength of the mixes from other researchers’ experimental work. The predicted results corresponded well with the experimental results and the percentage difference was found to be less than 5%. Portland cement is the most manufactured material on earth, with production reaching approximately four billion tonnes annually (Bourtsalas et al., 2018). Due to its binding and chemically-active nature, it has been widely used in concrete construction. Concrete, as a whole, is stable, hard and durable and has been one of the most preferred and favorable building materials because of its ease of production and use (Han et al., 2016). The only disadvantage is its cost. In addition, plain cement production emits large amounts of carbon-dioxide and poses a great threat to ecological balance. This has led to the development of similar alternative materials which are natural, or waste or industrial by-products (Turu’allo, 2015). These materials are termed as mineral admixtures and are responsible for the enhancement of many properties of concrete in both fresh and hardened states (Ramadhansyah et al., 2011). By their nature, different materials have different properties and can be used appropriately depending on requirements (Srinavin & Tunming, 2016). Fly ash is one such material (Ruan & Unluer, 2017). It is removed as a residue from nuclear power stations while producing electricity, and the power stations are in need of suitable economical means of its disposal (Ashadi et al., 2015). In contrast, the construction industry utilizes fly ash as a supplementary cementitious material for producing massive, high performance and economical means of construction (Hemalatha & Ramaswamy, 2017). Fibres are a common type of filler used in concrete composites to enhance their mechanical strength (Nurjaya et al., 2015). Among the various types of fibers, steel fibers are the most prominent, due to their high modulus of elasticity and greater performance in tension. They have additional advantages, such as ease of manufacture and availability (Antonius, 2015). This fiber mechanism is applied in paving for factories and airports, provides reinforcement in concrete projections and precast units, and is also used to study the mechanical behavior of concrete under tension, fatigue and impact load conditions (Murali et al., 2014; Alberti et al., 2017). The fibers bridge gaps and allow tensile stress to transfer across cracked sections, thereby providing residual strength to concrete by controlling the development of cracks and limiting their propagation (Ismail & Hassan, 2017), which ultimately prevents concrete failure. This study aims to experimentally identify the behavior of concrete with regard to impact resistance and its mechanical properties by adding 0.75%, 1.15% and 1.55% of steel fibers with a constant 40% of cement replaced by fly ash. It also develops a statistical model to predict the strength and impact energy of the concrete. Ordinary grade 53 Ultra Tech Portland cement conforming to IS 12269-1987 with a specific gravity of 3.15 was used in the concrete mixtures. The initial and final setting times of the cement were observed to be 31 minutes and 315 minutes respectively. The chemical properties of the cement are shown in Table 1. Locally available river sand conforming to IS 383-1970 with a specific gravity of 2.45 and grading corresponding to zone II from table 4 of IS 2386 (part 3)-1963 was used as a fine aggregate. Crushed coarse aggregates of a nominal size corresponding to 10-12.5 mm with a specific gravity of 2.645 conforming to IS 383-1970 were used. Class C category fly ash (as shown in Figure 1) with a specific gravity of 2.18 obtained from Neyveli Lignite Corporation was used. The chemical composition of the fly ash is shown in Table 1. Master glenium Sky 8233 (formerly Glenium B233) from BASF conforming to ASTM C494 type F category is a high-performance super plasticizer based on polycarboxylic ether, which is free of chloride, contains low alkali and is compatible with all types of cement, was used as a water reducing agent (0.35-1%). Hooked-end steel fibers, length 30 mm and diameter 0.5 mm, and with an aspect ratio of 60, as represented in Figure 1, were added at percentages of 0.75, 1.15 and 1.55. Locally available potable water conforming to IS 456-2000 was used. The mix was composed of cement, fly ash, fine aggregate, coarse aggregate, steel fibers and super plasticizer. Their proportions are shown in Table 2. Fly ash partially replaced the cement at a level of 40%. Thus, the cement content varied from 320 kg/m3 to 192 kg/m3 with the fly ash addition (128 kg/m3). The mix design was formulated for the concrete with a mix ratio of 1:2.93:3.58, and with a 0.45 water-cement ratio to attain a target strength of 35 MPa at 28 days. Steel fibers were added at levels of 0.75, 1.15 and 1.55% and super plasticizer was added as a water reducing admixture up to a maximum of 1%, based on the increasing amount of steel fibers. The mix proportions are shown in Table 2. A compression test was carried out on concrete cubes with dimensions of 100×100×100 mm3, which were subjected to curing periods of 28 and 56 days. The test was conducted with a standard compression testing machine conforming to IS 516-1959 (reaffirmed 1999). Split tension is an indirect measure of the tensile strength of concrete. Cylinders 200 mm high and 100 mm in diameter were used for the split tension test as per ASTM C496/C496M-11. Flexural strength (modulus of rupture) tests were conducted on standard prisms sized 500mm×100mm×100mm, as per IS 516-1959 (reaffirmed 1999). ACI 544.2R-1989 recommends the procedure for impact tests on cylindrical concrete specimens. The test was modified using concrete cubes sized 100mm×100mm×100mm, and a hammer weighing 135 N was dropped from a height of 413 mm (Murali et al., 2014). In this case, the load was transferred through a spherical steel ball, diameter 64.5 mm. The number of blows required to achieve complete failure of the specimen was identified. The experimental set-up for carrying out the compressive strength test and the corresponding strength plots for normal and fiber-reinforced fly ash concrete at 28 and 56 days are shown in Figures 2a, 2b, and 2c, respectively. From Figure 2, it can be seen that the compressive strength of the control specimen was 36 and 38 MPa at 28 and 56 days, respectively. When steel fibers were added at levels of 0.75%, 1.15% and 1.55% of the volume of concrete, the strength increase in the compression was observed to be 4-20% at 28 days and 10-27% at 56 days. This may be because of the stress transfer capability of steel fibers, by which crack propagation due to internal stresses was prevented (Yazici et al., 2007). The concrete with 40% of the cement replaced with fly ash showed decreases in strength of 15% and 3% at 28 and 56 days, respectively. The loss in compressive strength due to the fly ash cannot be prevented, even with the addition of steel fiber (Atis & Karahan, 2009), whereas the difference in strength can be reduced. The addition of steel fibers to the fly ash concrete had a positive influence in improving its strength. In comparison to the control concrete, the addition of steel fibers at levels of 0.75, 1.15 and 1.55% to the fly ash concrete resulted in decreases in strength of 7.5% and 2.5%, and an increase of 2% at 28 days; and increases of 4, 10 and 16% at 56 days, respectively. The experimental set-up for carrying out the split tensile strength test and the corresponding strength plots for normal and fiber-reinforced fly ash concrete at 28 and 56 days are shown in Figures 3a, 3b and 3c, respectively. From Figure 3, it can be seen that the split tensile strength of the control concrete at the end of 28 and 56 days was 2.32 and 2.68 Mpa, respectively. The addition of steel fibers resulted in an increase of 25-70% at 28 days and 15-50% at 56 days. When the fly ash partially replaced the cement (40%), the strength of the control concrete had decreased by 18% at 28 days. When steel fibers were added at the levels of 0.75%, 1.15% and 1.55% to the fly ash concrete, the reduction in strength compared to conventional fiber-reinforced concrete was found to be 13- 25% at 28 days. At 56 days, the fly ash concrete showed a decrease in split tensile strength of 2.13 MPa. However, the normal concrete containing fibers exhibited a better performance compared to the fly ash concrete containing the same amount of fibers. The fly ash based steel fiber-reinforced concrete showed an increase in strength of 7-25% compared to the control concrete at 56 days. The experimental set-up for carrying out the flexure strength test and the corresponding strength plots for normal and fiber-reinforced fly ash concrete at 28 and 56 days are shown in Figures 4a, 4b, and 4c, respectively. With reference to Figure 4, the flexure strength of control concrete is found to be 4.2 and 4.6 MPa at 28 and 56 days, respectively. With the addition of 0.75%, 1.15% and 1.55% of steel fibers to the control concrete, increases in strength of 29%, 47% and 57%, and 43%, 57% and 65%, were observed at 28 and 56 days, respectively. The differences in strength between normal and fly ash based steel fiber reinforced concrete were observed to be 30%, 20% and 12% in relation to the addition of 0.75%, 1.15% and 1.55% of steel fibers, respectively at 28 days. The differences in strength between normal and fly ash concrete at 56 days containing 0.75%, 1.15% and 1.55% of steel fibers were found to have decreased by 18%, 19% and 21%, respectively. The addition of steel fibers to plain concrete can improve its tensile and flexural performance by bridging cracks due to their post cracking ability. Therefore, the fibers play a crucial role in enhancing the brittle and non-ductile tensile performance of plain concrete (Yoo et al., 2015). The fly ash had several advantageous characteristics, such as improvement in workability and a reduction in permeability by the filling of micropores; these depend on the chemical composition and degree of fineness of the fly ash. The combination of fibers with fly ash improves workability and increases the strength gain of the concrete (Topcu & Canbaz, 2007). Figures 5a, 5b, and 5c shows the experimental set-up and energy plots for normal and fiber-reinforced fly ash concrete at 28 days and 56 days. From Figure 5, the final impact energy can be calculated according to Equation 1, showing that the control concrete exhibited maximum impact energy of 780.57 kN mm and 1115.1 kN mm at 28 and 56 days, respectively. When the steel fibers were added at levels of 0.75%, 1.15% and 1.55%, the energy increase was observed to be 93%, 143% and 229%, respectively at 28 days, and 65%, 125% and 175%, respectively at 56 days. The fly ash concrete with 1.55% fiber content exhibited maximum impact energy of 1672.64 kN mm and 2174.4 kN mm at 28 and 56 days respectively, which is an increase of 114% and 95% on that of the control concrete. The addition of the steel fibers drastically improved the impact strength of the concrete compared to conventional plain concrete. The addition of 1.55% steel fibers provided the highest impact strength amongst all the mixes. The steel fibers in the conventional concrete helped to attain higher impact energy than in the fly ash concrete. Although the fly ash concrete showed better impact strength at 56 days, this was comparatively lower than the conventional concrete with fibers. The study has identified the effect of the addition of fly ash and steel fibers to concrete using an experimental procedure and statistical investigation. The findings of the research are as follows: (1) The addition of steel fibers to conventional concrete resulted in an increase in strength of 4-20% in compression, 25-70% in split tension, 29-57% in flexure and 93-229% in final impact energy, for levels of 0.75%, 1.15% and 1.55% of fiber at the end of 28 days of curing. At 56 days, the increase in strength was observed to be 10-27% in compression, 15-50% in split tension, 43-65% in flexure and 65-175% in final impact energy for the same levels of steel fiber content; (2) At 28 days, the addition of fly ash did not play a significant role in improving the strength of the concrete, but after 28 days it did start to enhance it. At the end of 56 days, a strength increase of 4-17% in compression, 7-25% in split tension, 17-30% in flexure and 25-95% in final impact energy compared to the control concrete was observed in the fly ash concrete; (3) Under impact, the fly ash concrete performed comparatively worse than the conventional concrete, even with the addition of steel fibers, at 28 days. However, a considerable increase in strength and impact energy was observed at 56 days. Equations for compression (3, 7), split tension (4, 8), flexure (5, 9) and final impact energy (6, 10) were derived for 28 and 56 days. When validated, they showed closer agreement with the experimental results obtained at the end of 28 days. The errors in the predicted results may be because of variations in the physical and chemical composition of the cement, fly ash, aggregates, water and steel fibers; the methods of mixing, placing, curing and transportation can also affect the test results to a certain extent.